String quartet, repertoire and performance. A native of Toronto, I earned a BMus degree from the University of Toronto and a Masters and Doctor of Music from the State University of New York at Stony Brook. I have studied with David Zafer, Joyce Robbins, Metro Kozak and with members of the Juilliard and Orion string quartets. I have been a member of the Penderecki String Quartet since 1999 and have toured along with its other members to China, Brazil, Mexico, France, Italy, Spain and Russia, and we have recorded over 25 discs together. Prize winner of the Eckhardt‑Grammatté National competition and the Conseil Québécois’ Prix Opus. Artistic director (2000-2007) of NUMUS Concerts where he created several multi-media events at the Perimeter Institute and with Dancetheatre David Earle. 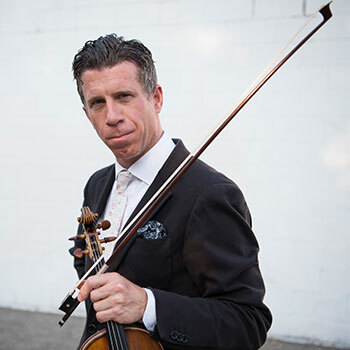 He has performed a wide range of music, performing baroque with Consortium Aurora Borealis and Les Violons du Roy, Cuban jazz with Hilario Duran, as well as collaborating with pipa virtuoso Ching Wong, NYC’s DJ Spooky and rap star Jay-Z. As guest concertmaster, he has appeared with the Kitchener-Waterloo Symphony, the Hamilton Philharmonic, the New Zealand National Symphony and the Canadian Opera Company. Edvard Grieg, Complete Sonatas for Violin and Piano, Chestnut Hall Records 2014. Ludwig van Beethoven, String Quartets Op.132 and 135, Marquis Classics 2013. Bela Bartok, Complete String Quartets, Eclectra Records 2006. My teaching is Galamian-based, and I emphasize slow scale practise as a chance to undo the tensions that get built up from the desire to succeed. I also teach a number of dexterity and muscle building exercises largely attributed to D.C. Dounis. I aim to get right to the heart of the matter in lessons and help students find 'deliberate practise' in their work.